Security forces capture murderous terrorist, IDF publishes footage from operation. Israel's security forces summarized their pursuit of Ariel terrorist Omar Abu Lila, 19, who on Sunday murdered two Israelis and injured a third. 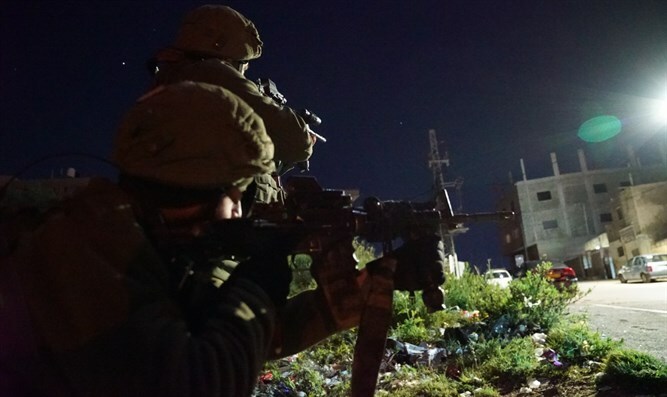 "Over the past few days, IDF soldiers have worked together with Shabak (Israel Security Agency) and Border Police to locate Lila and capture him," the IDF said in a statement. "The capture was successful thanks to intensive efforts in the areas of intelligence, evidence gathering, and operational activities. It is the latest in a string of terrorist eliminations carried out by security forces during the past year. "In addition, the IDF worked to arrest those who are suspected of aiding the terrorist after he carried out the attack. "The IDF will continue to act to protect residents' security and to defeat terror." כוחות הביטחון תפסו את המחבל הרוצח בזכות פעילות מודיעינית ומבצעית מאומצת. צה''ל פרסם תיעוד מתוך הסריקות שבוצעו בשטחי יו"ש.